Unitarian Universalists have affirmed my sense of being called to ministry by allowing me to be present with them in their lives and in their congregations in very significant ways at the boundary times of life. I have tried to honor this trust, to be worthy of it. To carry out this work to which I believe I have been called, I feel privileged and blessed. marriages, when they are called "marriages" or when they are restricted by the state to being "unity ceremonies" or "services of union"
I know that each ceremony is personal, and I work with the people and community to give meaning to the services. Throughout my ministerial career I have appreciated the ceremonies that have grown organically within the congregations I have served. 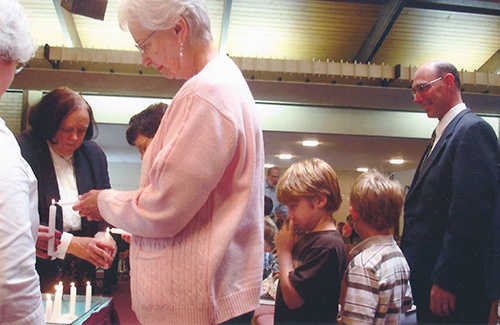 From lighting of candles to water communions, I help congregations strengthen the meaning of their celebrations. I am pleased to use milestones in the life of the congregation and the denomination to spread awareness of Unitarian Universalist achievements within the congregation and to the wider community. The photograph at left shows me posed with photos of the former minister of the church I was serving. 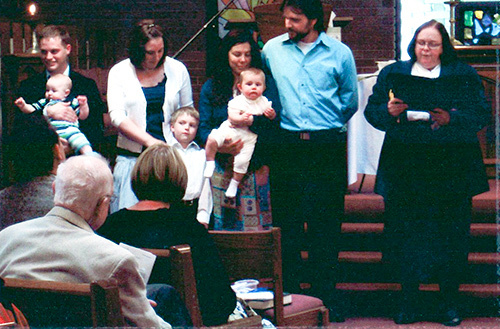 The local newspapers covered the congregation's dedication of a plaque, and reported on the minister's humanitarian deeds and deserved world-wide recognition. Read the story about Rev. 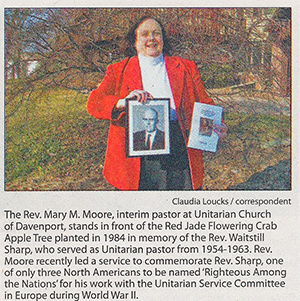 Waitstill Sharp and the Davenport Unitarians. Unitarian Universalists consistently join with people of faith from diverse backgrounds to celebrate community and our common humanity. 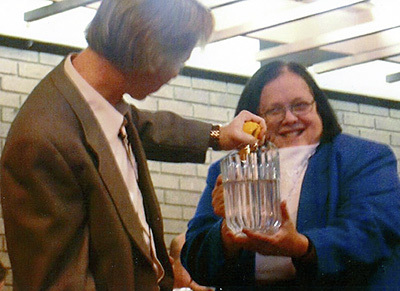 I am proud that congregations I have served have been leaders in interfaith outreach and activities. 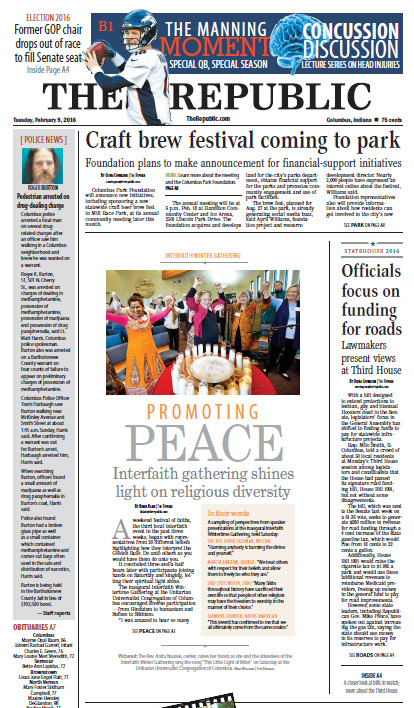 Sometimes our actions have earned the attention of local media, such as the winter interfaith gathering organized by the Unitarian Universalist Congregation of Columbus while I was their Interim Minister. That event garnered front-page attention in the Republic. See the full story in a PDF.